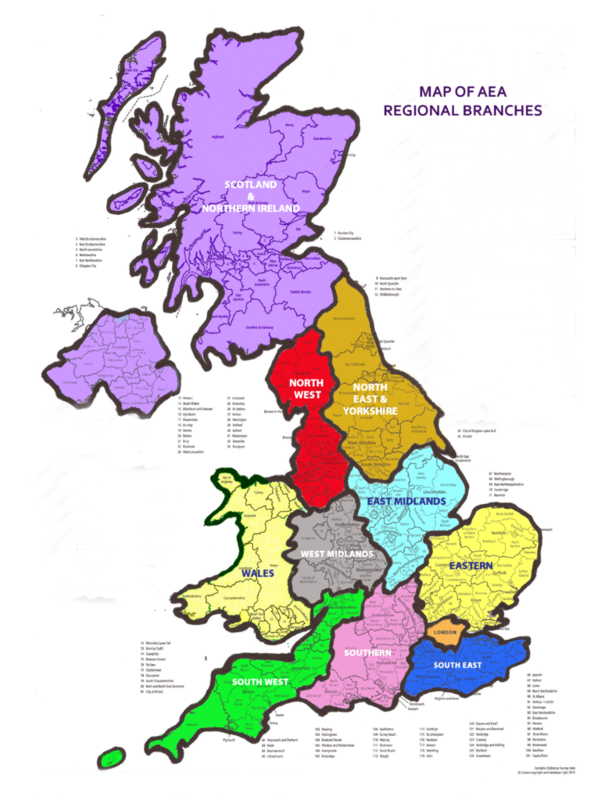 There are eleven regional branches of the Association covering the United Kingdom. They meet three or four times a year and give their Members the opportunity to discuss matters relating to the conduct of elections and electoral registration as well as the internal workings of the Association. A map of the Branch areas is shown below. Click on it to view a larger version and zoom in for detail. Below is a table showing contact details for all of the AEA’s Regional Branch Secretaries to whom all enquiries and approaches concerning Branch matters should be initially made. Click on the Secretary’s name to send an e-mail. Below is a table showing all UK authorities in alphabetical order with the AEA Branch of which an officer of the authority is a Member or would become a Member upon joining the Association. The list is inevitably very long, so you can find an authority name by pressing CTRL+F and entering part or all of the authority name in the search box which is usually displayed (depending which browser you are using) top right or bottom left of your screen – this works for finding text on any web page.